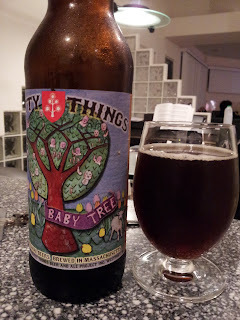 I really enjoyed my last Pretty Things beer Jack D'or, so I was willing to shell out the $$ for this. No, I've not yet tried The Stoic, but this is one of the best American quadrupel ale's I've ever had, and I think Brat's agreed on the deliciousness. The flavors are clean, and crisp (more of those cola flavors I love! ), the ABV is high, and the bottle design is aesthetically pleasing. Too bad the brewery is still quite small, so we won't be seeing a drop in price anytime soon.